Yuletide: A Pagan Christmas – Forza Nuova U.S.A. Prior to the importation of Christianity to Northern Europe, the native peoples of our continent celebrated a multitude of religious festivals. Their faith, now referred to as Pagan (but sometimes referred to as Asatru, or Wodenism, within the reconstructionist community), was polytheistic, and followed a religious calendar (Wheel of the Year) that was extremely busy in the way of festivals. Particularly relevant to our culture and customs are the Norse and Germanic Pagan faiths, which were essentially interchangeable belief systems. The differences between the two were in language only. Both worshipped the same deities, observed the same festivals and practised their faiths in the same way – hereafter, I shall simply use the term Pagan or Paganism as a catch-all term for the belief systems once universally practised in England, The Netherlands, Germany, Denmark, Norway, Sweden and Iceland, and I shall briefly explore their celebration of Yuletide. Yuletide is a festival of particular importance to Pagans, then and now. Celebrated at the North of the Wheel of the Year – which in itself denotes winter and darkness – it is often considered the most important of all Pagan festivals, and this is evident by the extent to which Christianity adapted its own rites and rituals to suit the Pagan sensibilities of Northern Europe. Its features, which I shall explore in this article, have survived almost entirely in tact to this day, even though the great many of us who practise them would not even think to identify them with Pagan religious traditions. There are, of course, certain aspects that did not survive to permeate modern secular society, but are still nonetheless important to those who have sought to reconstruct the Old Traditions, as they’re often colloquially referred to. Like many Pagan festivals, the greatest clue for Yuletide’s existence can be found in historic days of months in the modern calendar. The earliest references to this period as a festival come from the Proto-Germanic Ærra Jéola/Jœla (literally “Before Yule”) and Æftera Jéola (“After Yule”), the names of the periods we now know as December and January. And the Old English/Frisian Gœla or Giuli, which represented a 12-day period in between December and January – this occurred when the Pagan Europeans used a lunar calendar, which left 12 excess days at the end of the year. Similarly, the Old Norse word attested to this period is Ýlir (Germanic Paganism: Theology & Religious Practises of the Germanic Peoples, p322). These were documented by, amongst others, the Roman historian Tacitus (who wrote an extensive works on the pre-Christian peoples of Northern Europe, entitled Germania), as well as the English historian Bede, who attributed the Old English version of the word Yule to a specific month of the Anglo-Saxon calendar. The modern noun Yuletide first came into popular usage in approximately 1475 AD. It can be assumed that this marked gap in the usage of the word was a result of the continuous process of Christianisation being undertaken, with many words of a Pagan connotation airbrushed from popular discourse as a means of reducing the inclination to return to the old ways. However, there are always clues that remain in language from the Old Times. For instance, the days of the week are all named after the ancient Pagan deities; Thursday, from the Old English Þūnresdæg, meaning ‘þunor’s day’, is just 1 of 7 examples of this. In the Old English calendar, Yule, or Géol in Old English (pronounced ye-ool), is generally understood to have consisted of between 3 and 12 days of festivities at the end of December (Path to the Gods: Anglo-Saxon Paganism, p88). Most reconstructionists take the view that the celebration is 12 days long, beginning on or the night before the Winter Solstice (21st December) and ending on 1st January. The Winter Solstice is of particular importance to the Pagan faith, as it symbolises the rebirth of the sun after the year’s longest night. In antiquity, this was of particular importance. The Sun is, after all, the enabler of all life on earth, a fact especially potent to the minds of the original Pagans of Europe, who’s entire livelihoods were based on the success or otherwise of their crops. Today this is seen as a festival of light, on which the Sun deity Sunne (from whom we take both the week day name Sunday (Old English Sunnandæg, literally meaning Day of Sunne) and the name of the distant star itself) may be venerated. This is not an aspect of Yuletide that modern secular Christmas traditions have adopted, but most people always seem to regard the 21st December as the beginning of the festive period proper – an example of the collective unconscious, as Dr Carl Jung would have perhaps theorised. The other crucial date of Yuletide is Módraniht (Old English), or Mothers’ Night. The specific date of this celebration varies depending upon source, with some scholars suggesting that this occurred on the Winter Solstice, the night immediately prior to the solstice or even on varying days depending on the lunar pattern (Germanic Paganism: Theology & Religious Practises of the Germanic Peoples, p322-4). However, it is generally accepted that the Pagans of England celebrated Mothers’ Night on either the night of the 24th or the 25th December. This is a night on which the female deities of the Pagan faith are brought into greater focus, with a particular focus on – according to certain sources – a semi-Goddess named Frau Holda (Mother Holde in modern English, although some sources state that Holde and Freyja, the most prominent Pagan Goddess and matriarch of the Aesir, are one in the same). According to legend, Holde is the protectress of agriculture and women’s crafts. The former is of particular interest at this time of year, given the celebration of the rebirth of the sun 3 or 4 days prior and the hope for a good crop the following year. Traditionally, Pagans hold a great family feast on Mothers’ Night – it would not be a leap to suggest that, A) Christianity moved the celebration of the birth of Christ to the 25th December to suit Pagan sensibilities, and B) the custom of Christmas Lunch, a traditionally large family meal, is derived directly from the Mothers’ Night tradition. One cannot forget that the 12th and final day of Yule is New Years’ Day, which today marks the coming of the New Year. It’s not clear whether or not the ancient European Pagans celebrated this particular day as the first of the year, or whether or not this was instead represented by the Solstice. I suspect the latter to be the case, but the tradition of celebrating the New Year is almost certainly derived from the Pagan concepts of toasting the prospect of a good crop the following year. It wasn’t until the Protestant reformation that the New Year was particularly important for Christianity, and even then Puritans such as Oliver Cromwell sought to outlaw such celebrations. Today, 1stJanuary marks the final day of Yule as most observers understand it, thus we can conclude that this celebratory date and its alignment with modern secular New Years’ Day is an amalgamation of Pagan, Christian and secular traditions. The 12 days of Yuletide are considered sacred to those of the Pagan faith, and it is tradition that no work is to be undertaken during this period. This notion is derived from the historical context of the ancient Pagans, who would halt the use of agricultural tools throughout the period in which Yuletide was observed. In particular, this was a period when the female members of the household, mothers especially, were expected to enjoy a period of total rest and relaxation. Household duties would instead be performed by the men, as their agricultural duties were placed on hold for the duration. This is something quite typical of ancient Pagan households, which were inherently matriarchal in Germanic societies with the mother representing the head of the household. In contemporary Pagan faiths, those who are able to will cease work for the period 21st December – 1st January, and will celebrate each day of the festive period, with the 24th/25th December marking the culmination of festivities in English antiquity. Aside from the pertinent dates to Yuletide, there are many customs that Pagans followed before Christmas was Christmas, and therefore still follow today. What is remarkable is how many of these idiosyncrasies overlap with Christmas traditions in a modern secular society; they do so to the extent that one could argue, and not without foundation, that modern Christmas is inherently Pagan, especially given the fact that a great many of those who celebrate the festive period do not observe the Christian nature of things, such as Midnight Mass or a thought for the birth of Christ (who, by the way, was not born on 25th December). Whilst of course those celebrating Christmas today do not associate their customs with Pagan tradition, and nor should they if they do not wish to, the similarities cannot simply be explained away as coincidence. One of the most prominent customs of Christmas is that of erecting and decorating a tree, either coniferous or imitation, in the house. This is no different in the Pagan celebration of Yuletide. Prior to the Christianisation of Northern Europe, the Pagans decorated trees nearby with colourful ribbons and shiny toys – these were coniferous trees, because they’re the only ones still leafed throughout the winter months. This was done as a tribute to the Gods and Goddesses. The practise of bringing the tree indoors is thought to have begun when the monarch of any given kingdom in England, Germany or Scandinavia decided that his land was now Christian, thus forcing the Pagans to cloak their practises. Harsh penalties awaited those found to be foul of the inevitable heresy legislation, so if this legend is true it demonstrates some serious commitment on the part of the Pagans. This practise all-but died out in the intervening years between Christianisation and the 18th century, for it was alien to Christianity and most probably seen as a remnant of the heretical days. However, by the early 18thcentury, Christmas trees had become commonplace in Lower Rhineland, Germany, and came to symbolise Christmas as viewed through the lens of German culture. They gained widespread acceptance as a result of Prussian officials adopting the custom in 1815, and then were further popularised when the Prussian army erected Christmas trees in their barracks during the Franco-Prussian war (1870). Interestingly, but perhaps not surprising given the Pagan origin of the custom, Christmas trees were not put up inside churches until the early 20th century. The tree is also thought to have symbolised Yggdrasil for Pagans, an immense mythical tree that connects the 9 worlds of, according to Norse mythology (Prose Edda & Poetic Edda). This tree is mentioned in the Anglo-Saxon chronicles, and the Old English classic Beowulf. It’s believed that offerings to the deities would be placed underneath the tree, wrapped as gifts, which may possibly be a source for the modern concept of placing presents beneath the Christmas Tree. Other common features of a secular Christmas are steeped in Pagan tradition. For instance, the Holly Wreath that so many of us hang on door knobs around Christmastide were a Pagan invention. They were often prepared to mark the changing of seasons, which of course Yuletide marks, and were thought to symbolise fertility and a good harvest. It was not until the Lutherans, in 16th century Germany, began preparing these around Christmas that they came to be associated with the Christianised version of events. Nowadays these decorations are commonplace, almost as much as the seemingly obligatory Christmas lunch. Again, this is another tradition that has survived, or rather, was resurrected from Pagan times. One of the most crucial features of any Pagan celebration was a great feast (Stephen Nissenbaum, The Battle for Christmas, 1997), complete with a large chunk of meat as the focal point. Yuletide, Eostre (Easter, Spring Equinox), Winter Nights (Halloween) and so on; the are all marked with a great feast! And undoubtedly, no Pagan celebratory feast is complete without alcohol, most typically mead, drunk from great horns (symbolising the particular utensil associated with the God Woden (Norse: Odin, German: Wotan)). Perhaps this goes some way to explaining the Abrahamic faiths’ crusade against alcoholic beverages? Conjecture, of course, but an interesting thought nonetheless. The concept of archetypes in psychoanalysis was developed by Dr Carl Gustav Jung, a German scientist, psychologist and student – and later, critic – of Sigmund Freud. Jung supposed that the archetype is a primitive mental image, that manifests itself in different ways amongst different cultures, and is present in the collective unconscious of peoples. The crux of the theory is that these are concepts of certain things that are not socially constructed, but are of a more primordial nature. These archetypes are destined, according to Jungian theory, to manifest themselves repeatedly over time within a culture, and they are inescapable regardless of any attempts to engineer them away. This analysis has in scholarly circles been used to draw comparisons between the modern myth that is Santa Claus, and the Pagan God Woden. In Pagan mythology, Woden leads what’s known as The Wild Hunt; beginning on Winter Nights (Halloween), Woden leads comrades from Valhalla in a ghostly procession across the skies of the material world, scouring for lost souls. The early Pagans used to attribute many of the ominous sounds of dark, blustery winter evenings to this procession, in which Woden was always depicted as a bearded, cloaked man on a chariot led across the skies by horse, or riding the horse himself. Woden, like Santa Claus, was considered omniscient (think of the tale that Santa will know if you’ve been naughty as a child), and the similarity of physical depiction is quite evident (Dictionary of Norse Mythology and Legend, p187). The hunt was thought to culminate on the most prominent day of Yuletide, which for Pagans in England (and evidently, Germany too) was the 25th December. The theory goes that, regardless of the degree to which Christianity was imported to replace the Pagan traditions, archetypes can simply not be erased, and therefore we get this remarkably Pagan-like Santa Claus who is simply another manifestation of the God Woden. This attestation is by no means chimerical, and is one that, as aforesaid, has been drawn by historians and theologians alike. In any case, more broadly one can say that Christmas is an archetype of our desire to celebrate midwinter in one form or another. This is displayed in the traditions that, despite their suppression as heretical, have reappeared in one shape or form to completely permeate our concept of a secular Christmas. Another such tradition is carol singing, something now considered old fashioned to a degree, and therefore associated with the church and Christmas. The Pagans, too, had a form of carol singing that was divided into two sections; firstly, the practise of singing folk songs and offering mead at a neighbour’s door in exchange for a gift and, secondly, the practise of visiting an orchard to sing folk songs as a tribute to nature in the hope of being rewarded with a good harvest the following year. This practise was known as Wassailing – it was so widely practised that the name Wassail was given to warm mulled cider in medieval England. In more archaic terms, Wassail can be used interchangeably with the modern slang “cheers”, hence you may see the term used on Yuletide greetings cards. There are also customs that, mostly for reasons of practicality, have sadly not survived the test of time. One such tradition is the Yule log, which was traditionally a large log from an Oak trunk brought ceremoniously indoors from the forest and lit, with the intention that it were to burn for the duration of Yuletide. Nowadays, most of us do not have the facilities to burn half an oak tree for 12 days, but the custom may explain our propensity to associate Christmas with a warm, cosy log fire. Similarly, the customary offerings to the Gods and Goddesses of Paganism have not survived, firstly as a result of monotheistic Christianity and secondly, because they would today be denounced as mere superstition. Whilst the who’s who is perhaps not so important for this exercise, it’s worth noting that the most prominent Gods / Goddesses of Pagan antiquity were Woden, Tiw, þunor (modern English spelling: Thunor) and Freyja, as described by Tacitus and Bede. Their importance is further confirmed by the fact that the days of the week are named after them, along the days of the sun and the moon. There are also a multitude of place names in England, Germany and Scandinavia that are derived from names or nicknames given to the deities. In terms of their importance during the festive period, it is reasonable to believe that these deities were honoured throughout Yuletide, with Woden and Tiw being particularly prominent at any feast, and Freyja’s importance as Goddess of wealth and fertility noted when wishing for a good harvest the following year. Finally, and on a somewhat sombre note, Yuletide is a period in which the veil between the material world and the spiritual world is believed to be more permeable. This means that one could feel closer to departed loved ones and ancient ancestors, providing pause for remembrance. Ancestor veneration is a prominent feature of pre-Christian Paganism, and as such it is a part of most feasts and celebrations, but only on Winter Nights and throughout Yuletide is the gap between the worlds considered to be significantly smaller. The veil is believed to be at its most pervious on the culmination of the Wild Hunt, which is Christmas Day – at this time, it was considered safer to remain indoors for fear of accidentally being swept into the afterlife by the Hunt, and seeing the Hunt with one’s own eyes was associated with immense bad luck and even plagues and other natural disasters. To conclude, it would be fair to say that Yuletide is not dissimilar from our secular conception of Christmas in the modern era. In some instances, the similarities could be explained as coincidence, but in others, such as the remarkable similarities between Woden and Santa Claus, or the objectively strange practise of bringing a coniferous tree indoors, have undeniably Pagan roots. The extent to which secular Christmas traditions have adopted the old rites and rituals of Pagan Yuletide is truly astounding, when taking all things into consideration. A faith which supposedly died out after being usurped by Christianity is manifesting itself in our most treasured holiday season. It is a true beauty to behold, but we would do well to link the celebration to our indigenous religious systems so as not to do a disservice to our ancestors who gave us this wonderful holiday season. William is a writer based in England, Great Britain. Forza Nuova USA will be set to help. 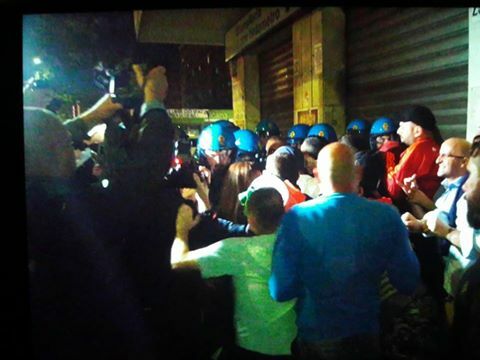 Forza Nuova Clashes With Police During The Magliana Security Walk. G7 Flop: Nothing of Value Concerning Refugees, This is an Italian Problem.